Unusually strong and immediate reaction to my casual tweet this morning. Others must share my plight – we can’t describe what we do without under-playing the impact of this stuff we try to describe ;-). Stuck with labels that narrow your true impact? 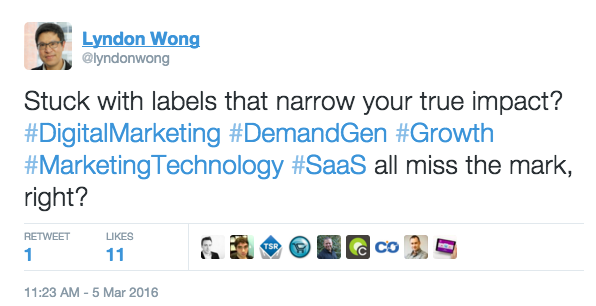 #DigitalMarketing #DemandGen #Growth #MarketingTechnology #SaaS all miss the mark, right? This is an eye opener. Nice to feel some affirmation.